Over the last two centuries, transportation innovations have drastically changed urban landscapes. This column explores how the mid-19th century transport revolution shaped the urban agglomeration of London. The results show Greater London’s population would have been 30% lower in 1921 without the railway network. The findings and the quantitative urban models employed highlight the role of modern transport technologies in sustaining dense concentrations of economic activity. Modern metropolitan areas include vast concentrations of economic activity, with Greater London and New York City today accounting for around 8.4 and 8.5 million people, respectively. These intense population concentrations involve the transport of millions of people each day between their residence and workplace, as surveyed in Redding and Turner (2015). Today, the London Underground alone handles around 3.5 million passenger journeys per day, and its trains travel around 76 million kilometres each year (about 200 times the distance between the earth and the moon). Yet relatively little is known about the role of these commuting flows in sustaining dense concentrations of economic activity. On the one hand, these commuting flows impose substantial real resource costs, both in terms of time spent commuting and the construction of large networks of complex transportation infrastructure. On the other hand, they are also central to the creation of predominantly commercial and residential areas, with their distinctive characteristics for production and consumption. In new research, we use the mid-19th century transport revolution from the invention of steam railways, a newly created, spatially disaggregated dataset for Greater London from 1801-1921, and a quantitative urban model to provide new evidence on the contribution of the separation of workplace and residence to agglomeration (Heblich et al. 2018). The key idea behind our approach is that the slow travel times achievable by human or horse power implied that most people lived close to where they worked when these were the main modes of transportation. In contrast, the invention of steam railways dramatically reduced the time taken to travel a given distance, increasing average travel speeds from around 6 mph for horse-drawn vehicles and 3 mph for walking to around 21 mph, which permitted the first large-scale separation of workplace and residence. This separation enabled locations to specialise according to their comparative advantage in production and residence. Using both reduced-form and structural approaches, we find substantial effects of steam passenger railways on city size and structure. We show that our model is able to account both qualitatively and quantitatively for the observed changes in the organisation of economic activity within Greater London. London during the 19th century is arguably the poster child for the large metropolitan areas observed around the world today. In 1801, London's built-up area housed around 1 million people and spanned only five miles East to West. In contrast, by 1901, Greater London contained over 6.5 million people, measured more than 17 miles across, and was on a dramatically larger scale than any previous urban area. By the beginning of the 20thcentury, London was the largest city in the world by some margin (with New York City and Greater Paris having populations of 3.4 million and 4 million, respectively, at this time), and London's population exceeded that of several European countries. Furthermore, London developed through a largely haphazard and organic process during this period, which suggests that both the size and structure of the city responded to decentralised market forces. Therefore, 19th century London provides a natural testing ground for assessing the empirical relevance of models of city size and structure. We begin by providing several pieces of reduced-form evidence on the impact of steam railways on the organisation of economic activity within Greater London. We first establish changes in parish population growth rates that coincide closely with the arrival of the railway. We next show that these changes in population growth are heterogeneous across parishes. In Figure 1, we display average population growth in the 30 years after the arrival of a railway station minus average population growth in the 30 years before its arrival. 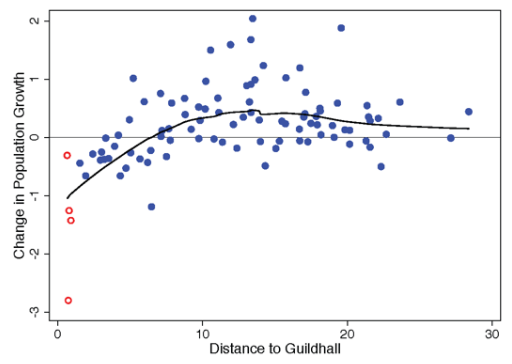 As apparent from the figure, we find that more central parishes (as measured by distance to the Guildhall in the City of London) experience a decline in population growth relative to more suburban parishes, consistent with the railway redistributing residential population within Greater London. To interpret this reduced-form evidence, we develop a new structural estimation procedure for an entire class of urban models characterised by a gravity equation for commuting. Although we only observe these bilateral commuting flows between the 99 boroughs within the boundaries of Greater London at the end of our sample period in 1921, we show how this framework can be used to estimate the impact of the construction of the railway network. In a first step, we use our bilateral commuting data for 1921 to estimate the parameters that determine commuting costs. In a second step, we combine these parameter estimates with historical data on population, land values and the evolution of the over- and underground railway network going back to the early-19th century. Using a combined commuter and land market clearing condition in the model, we solve for the implied unobserved historical values for employment by workplace and commuting patterns. Although we estimate the model's commuting parameters using 1921 information alone, we find that its predictions provide a good approximation to the available historical data. 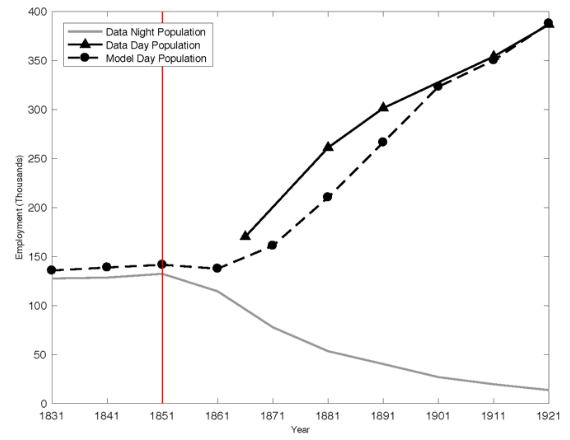 As shown in Figure 2, we find that the model captures the sharp divergence between the nighttime and daytime population in the City of London from the mid-19th century onwards. We also find that the model replicates the property of early commuting data that most people lived close to where they worked at the dawn of the railway age. Our methodology holds in an entire class of urban models, because it uses only the assumptions of gravity in commuting and land market clearing, together with the requirements that payments for residential floor space are proportional to residential income and payments for commercial floor space are proportional to workplace income. An implication of this property is that our results hold under a range of assumptions about other model components, such as the costs of trading goods, the determinants of productivity and amenities including the strength of agglomeration forces, the supply elasticity for floor space, and the reservation level of utility in the wider economy. Given the data for the initial equilibrium in 1921, we show that the observed changes in population and land values are sufficient statistics in the model for determining historical workplace employment and commuting patterns, and control for other potential determinants of the spatial distribution of economic activity. While our baseline quantitative analysis controls for these other forces, another key question of interest is the counterfactual of what would have been the effect of the new commuting technology in the absence of any other changes. To address this question, we make additional assumptions about these other model components, and pick one quantitative model within our class of urban models in order to solve for a counterfactual equilibrium. In particular, we choose an extension of the canonical urban model of goods trade and commuting following Ahlfeldt et al. (2015), which is particularly tractable, and enables us to explore alternative assumptions about structural parameters in a transparent and flexible way. Holding the supply of floor space and productivity and amenities constant, we find that removing the entire railway network reduces the total population and rateable value of Greater London by 30% and 22% respectively, and decreases commuting into the City of London from more than 370,000 in 1921 to less than 60,000. By comparison, removing only the underground railway network diminishes total population and rateable values for Greater London by 8% and 6% respectively, and brings down commuting into the City of London to just under 300,000 workers. In both cases, the increase in the net present value of land and buildings substantially exceeds historical estimates of the construction cost of the railway network. Allowing for a positive floor space supply elasticity or introducing agglomeration economies magnifies these effects. Using a calibrated floor space supply elasticity of 2.86 and elasticities of productivity and amenities to employment density of 0.05, in line with empirical estimates, we find that much of the aggregate growth of Greater London can be explained by the new transport technology of the railway. Taken together, we find that a class of quantitative urban models is remarkably successful in explaining the large-scale changes in the organisation of economic activity observed in 19th century London, and our findings highlight the role of modern transport technologies in sustaining dense concentrations of economic activity. Ahlfeldt, G, S J Redding, D M Sturm and N Wolf (2015), “The economics of density: Evidence from the Berlin Wall,” Econometrica 83(6): 2127–2189. Heblich, S, S J Redding and D M Sturm (2018), “The making of the modern metropolis: Evidence from London,” CEPR Discussion Paper 13170. Redding, S J and M Turner (2015), “Transportation costs and the spatial organization of economic activity,” in G Duranton, J V Henderson and W Strange (eds), Handbook of Urban and Regional Economics, Chapter 20: 1339–1398.